Courchevel is the best known of Les Trois Vallées ski areas, most famous for its high end clientele, and for its beautiful ski villages with upscale lodging – beautiful boutique hotels bearing 5 stars, gastronomic dining, designer shopping, and also fun activities for families and lively après ski. Courchevel has wonderful family fun ski zones, gorgeous groomed trails skiing, pretty glades and above tree line skiing as well. For lunch and après ski, Courchevel has great on mountain chalets. You can easily access the other ski resorts – Val Thorens and Méribel, from Courchevel by lift. Courchevel is one of the Top Family Ski Resorts in France. 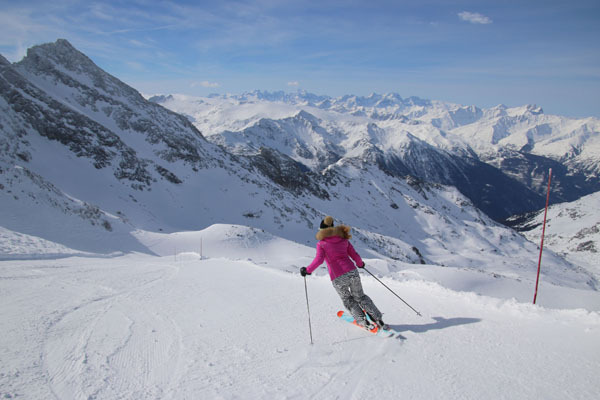 Val Thorens is the biggest of Les Trois Vallees, and the highest Alps skiing at 10,500′. Here you have vast above tree-line skiing, wide open bowls with a few groomed trails off each dramatic peak, plus limitless off-piste opportunities. Val Thorens has a big ski school for kids learning to ski. High capacity ski lifts, trams, gondolas and six packs shoot off in every direction. Val Thoren’s on mountain village is more modern, with bigger hotels and less of the quaint cozy feel – but therefore its more affordable than its sister valleys chic Courchevel and authentic Meribel.